Gyllenhaal and Tony Award winner Annaleigh Ashford will re-open the historic Hudson Theatre (139-141 West 44th Street) on Broadway this winter for a strictly limited 10-week engagement. Performances are set to begin Saturday, February 11, 2017, ahead of a Thursday, February 23 Opening Night, and will play through Sunday, April 23. Sondheim and Lapine’s masterpiece follows painter Georges Seurat (Jake Gyllenhaal) in the months leading up to the completion of his most famous painting, A Sunday Afternoon on the Island of La Grande Jatte. Consumed by his need to “finish the hat,” Seurat alienates the French bourgeoisie, spurns his fellow artists, and neglects his lover Dot (Annaleigh Ashford), not realizing that his actions will reverberate over the next 100 years. With music & lyrics by Stephen Sondheim and book by James Lapine, Sunday in the Park with George is directed by Sarna Lapine. 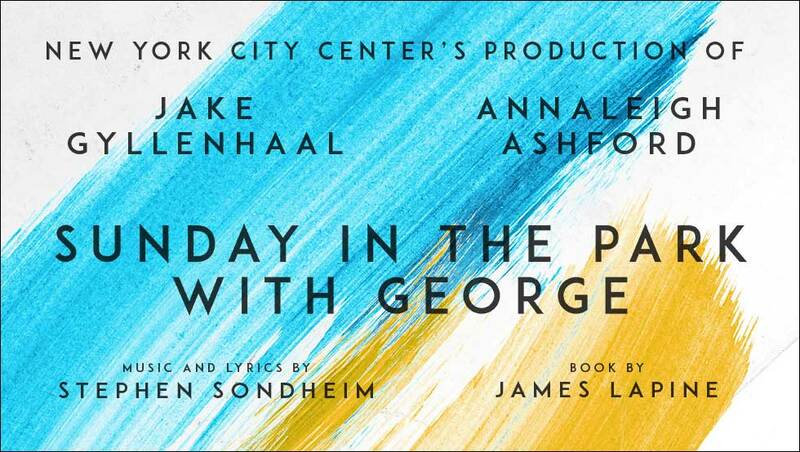 Sunday in the Park with George is produced on Broadway by Adam Speers for Ambassador Theatre Group, New York City Center, Jeanine Tesori, and Riva Marker. Tickets are now on sale and can be purchased online at www.thehudsonbroadway.com or by calling 855-801-5876.